This pie is called Siberian. Try to guess why? First of all, fish has always been a favourite food and often the main dish for people living by the sea or river. One of the famous Siberian dishes is “stroganina”, which is thin chips cut from fresh frozen fish (or it can be meat) and dipped into the mixture of salt and pepper. 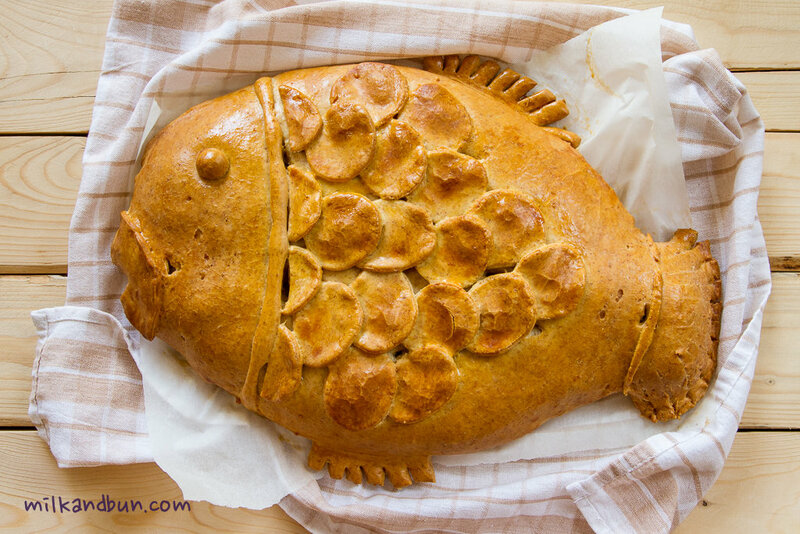 Also fish is used as a stuffing for large and small pies, for soups and stews. Also, it’s necessary to take into account the Siberian weather, during the winter the temperature is very low (or to be exact – the freezing cold), thus any fish can be easily frozen and kept outside for a long time. 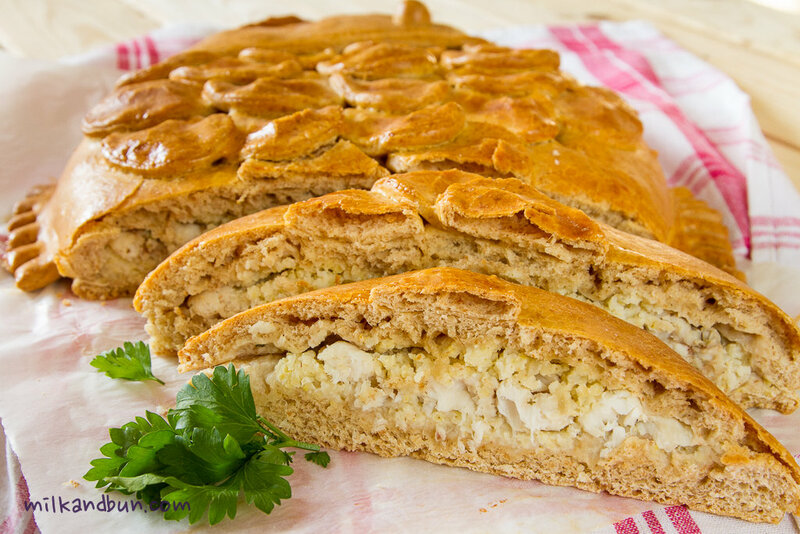 So, I used halibut for my Siberian pie, it’s a flatfish that live in the Sea of Okhotsk and Bering Sea (Russian North seas). Halibut is a valuable source of Omega-3 fat acids and vitamins-B, what makes the pie more healthy and tasty. You can substitute halibut with any other white-meat fish. Along with the fish I added cooked millet, it’s unusual cereal for the filling, but an interesting alternative to the common rice, it has a nice tender texture. The pie is satisfying and makes a delicious weekend dinner! To make a sourdough in a large mixing bowl, add warm milk, yeast, 1 tbsp sugar and mix well. Add around 100-120g sifted flour, stir throughly to get the consistency like for pancakes. Cover with a plate or wrap, and allow to ferment for 1 hour in a warm place. In another small bowl lightly beat eggs (with hand whisker) with 1 tbsp sugar and salt. Add the beaten eggs into a bowl with sourdough mixture. Sift the remaining flour, pour in butter or oil, mix to combine. Now, knead the dough for about 20-30 minutes on a flat surface. Add more flour, if needed. Place the dough in a large bowl, wrap it up and leave to rise for 1.5-2 hours in a warm place. First, you need to cook millet. Rinse it thoroughly under running water. After that, add millet and two parts boiling water in a small pan. After the water has return to a boil, turn down the heat, cover and simmer for 18-20 minutes. Let it cool. Heat oil in a frying pan, add onion and fry it on a medium heat until golden color. Mix fried onion with millet. Season to taste. Divide the dough into two parts. Roll out the smallest dough part into oval shape (38x30cm/1cm thick) and arrange it on a lined baking tray. Spoon millet mixture, then spread the fish cubes. Dot with butter, season to taste. Roll out the second part of the dough – large enough to cover the filling. Seal the edges. Decorate with trimmings. Cover the pie with tea-towel and let it rise for 20-30 minutes before baking. Cut three or four slits in the top. Brush the pie with the glaze. Bake the pie in preheated 180C oven for 35-40 minutes or until golden-brown. Brush the pie with melted butter, cover with tea-towel and let it rest for 10-15 minutes. Cut the pie into slices. If the filling is dry for your taste, pour over some melted butter. Serve with a glass of milk. Jan21January 21, 2015 • By milkandbun • This entry was posted in Baking, Fish and Seafood, Pies, Russian cuisine and tagged baking, cooking, dinner, dough, fish pie, food, food and recipe, food photography, halibut, leavened dough, millet, photography, photos, pie, recipe, Russian, Russian fish pie, Russian pie, Russian recipe, Russian yeast dough recipe, savory pie, Siberian pie, yeast dough. Bookmark the permalink. OMG this is unbelievable. How beautiful! I can’t believe how perfectly this became out. You never cease to amaze me. Truly! Wow thats so beautiful, it’s a piece of art. Stefano would love to have it!!! First I love the shape! Second the pie flavors look wonderful! 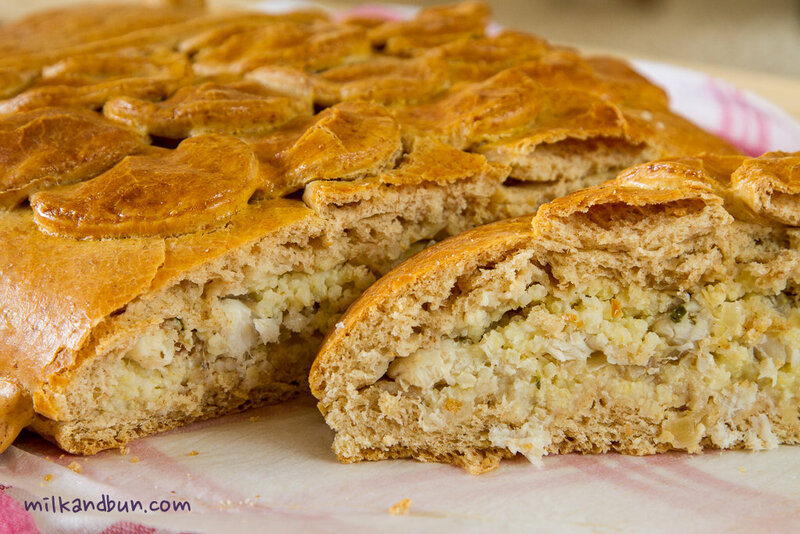 I love Halibut as a stuffing in a sweet/buttery bread…I will try it soon though I probably wont achieve the fish shape I hope I get the same beautiful crust! Thanks! You may also add some chopped fresh dill to the filling.